Paradise ponders, ancient Navy buddies edition... Jimmy B. and his wife Michelle are arriving this afternoon for a week-long visit. They were last here in September, when we moaned and groaned about their short (one day) visit. Our punishment is to be inflicted with them for over a week. :) We'll be sharing Thanksgiving with them and my brother Scott, who will brave the roads of snowy terror (we have snow in the forecast over the next few days). I'm going to be putting Jimmy to work helping me with the various electrical wiring projects, and Debbie is putting Michelle to work with the Thanksgiving cooking. Meanwhile, Mike B. sends this photo from North Carolina, where he's working on the CarveZilla project we're collaborating on. 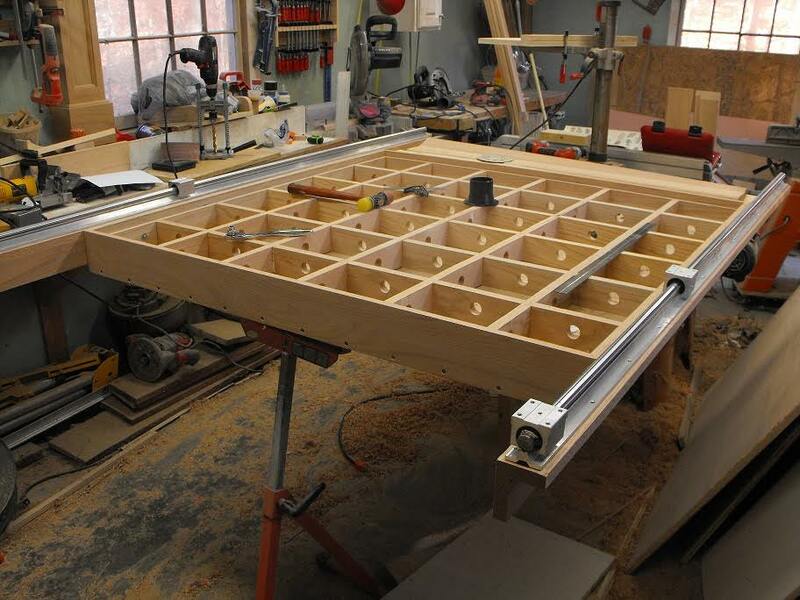 What you're looking at is the inside of a 4' square vacuum table, with X-axis rails on two sides. 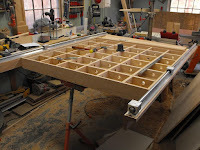 The vacuum table is missing its top, which will have lots of 1/2" holes on 2" centers all over it. We'll attach this to a vacuum cleaner (think Shop-Vac), then place a piece of wood on top to be machined. The vacuum will hold the workpiece fast to the vacuum table (we hope!). Those X-axis rails will support a carriage that can move 4' back-and-forth, and that carriage will support a pair of rails on the Y-axis, which will in turn support a carriage that move in that dimension. That carriage will support a pair of Z-axis (up-and-down) rails that will finally support something actually useful: a motor with a milling head attached. When we're all done, a Raspberry Pi computer will move that milling head about in three dimensions, and be able to carve basically anything we want, so long as it will fit in a space 4' x 4' x (about) 1'. Mike is building the things (one for each of us), and I'm doing the software and helping with the design. So far, he's doing most of the work, as I've been a bit distracted with other things. I spent most of yesterday working on the electrical boxes for our new deck's light fixtures. These fixtures will hang from a standard octagonal ceiling box. There are nine of the fixtures, and they will be arranged in a 3x3 pattern. Naturally, none of those positions fell into a place where the box could be conveniently attached to a truss. :) So to solve that problem, I came up with a simple design: a pair of 2x4 stringers that will be tacked to two trusses, and the ceiling box mounted in between them (photo at left below shows the idea). This approach lets me place the ceiling boxes precisely where I want them. The boxes are mounted at three different offsets, with three at each offset. I built them all yesterday, making the pile in the photo at right. You might note that the box sticks down below the stringers; that's because the builders are going to put a “skin” on the ceiling made of 3/4" thick tongue-and-groove wood, and I've mounted the boxes to be flush with that. Today I'll be building two more assemblies very similar to this, to hold a pair of duplex outlets that will also be mounted on the ceiling (to the north, toward the yard). This will give us power out there, should we need it. There will also be a pair of duplex outlets mounted on the house wall. Last night and this morning marked a couple of corners turned in our puppies' growing up. First one: Cabo (who has been sleeping in her crate in our bedroom) spent the night in the kitchen, in her crate, alongside Mako. She didn't cry at all. The crying was what prompted her staying in the bedroom; she apparently couldn't stand being separated from me. Now she's fine on that count; spent the entire night without making a peep. Second one: both Mako and Cabo were in their crates while I took a shower, and didn't howl. They've both been howling up a storm every time I took a shower, for reasons we've never figured out. One result of these corners being turned: I got the best night's sleep I've had in about eight months. I could use some more of that! We've been feeding the dogs at night for quite a few years, generally just before we go to bed. One thing we've noted with the puppies (but interestingly, not the adults) is that they need to drink water a couple of hours after they eat. That means I've been needing to get up to let them out of their crates for a drink (which I did last night, for instance, around 9 pm). So we decided to change our feeding schedule to mornings, starting today. Not one of the four dogs seemed upset about getting an extra feeding this morning. :) We'll see how they handle not getting fed tonight!